Our contributor, Summer Stone Polzel of Cake Paper Party, is back today with a new baking science experiment…. Flour is one of the most important ingredients in a cake recipe. It not only is the structural workhorse of a cake but provides important flavor and textural elements. Choosing the best flour for a cake recipe can be tricky. There are many options on the market and depending on where you are in the world, certain flours may or may not be available. Here I will try to clarify some of the differences between various types of wheat flours and show you how they translate to baked cakes. Wheat flour is commonly categorized for sale based on protein content. Flour is primarily composed of wheat starch but also contains protein molecules. Most of the protein in flour is the type which converts to gluten in the presence of water. The size of the flour granules can also play a role in the properties of a given flour and the resulting baked product. Finely ground flours create a smaller crumb and better texture in a cake. Flour can also differ because of the type of wheat grain of origin. Wheat flour comes from either hard wheat or soft wheat grain varieties. Hard wheat varieties cannot be ground as finely as soft wheat types and therefore do not work as well in cakes. Some flour manufacturers will label the type of wheat the flour originates from but often this information is not listed. Flour can also be divided into that which is bleached and that which is unbleached. Bleached flours are treated with chemicals to lighten the flour’s color. These chemicals include potassium bromate, benzoyl peroxide or chlorine. Health concerns over potassium bromate have caused it to be banned from use in Canada and Europe but are able to be used in the Unites States. Benzoyl peroxide is used in all flour types and does not affect gluten strength. Chlorine is only used in cake flour because it weakens gluten and allows water to be absorbed more readily. 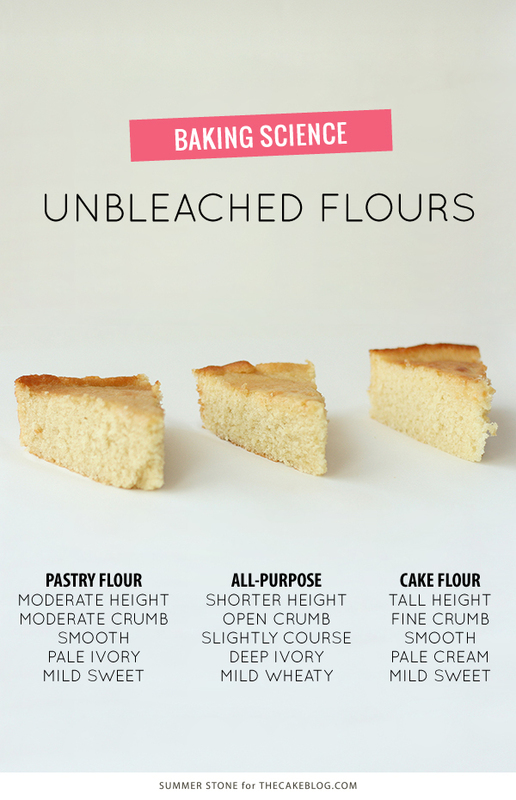 Unbleached flours are not treated with whitening chemicals. Bread Flour: Generally contains between 11.5 and 13.5 percent protein. Ground from hard wheat varieties. May be bleached or unbleached. Strong glutinous bonds result in an open and coarse crumb that is not ideal for cake baking. All-Purpose Flour: Protein content ranges from 9.5 to 11.5 percent. Often made from a mix of hard and soft wheat. May be bleached or unbleached. Found in many cake recipes but is often mixed with cake flour to improve the cake’s texture. Pastry Flour: Fine-milled soft wheat flour with protein content from 7 to 9.5 percent. Is usually found unbleached. Not common in cake recipes but the granule size and protein content make it a worthwhile option. Cake Flour: Fine-milled soft wheat typically comes from the heart of the wheat grain for the finest granulation. Protein content varies from 6 to 8 percent. Typically found bleached, but some manufacturers are now offering unbleached options. Often found in cake recipes but frequently is cut with all-purpose flour to mediate flavor and structural effects. Now let’s see how these differences play out in baking. 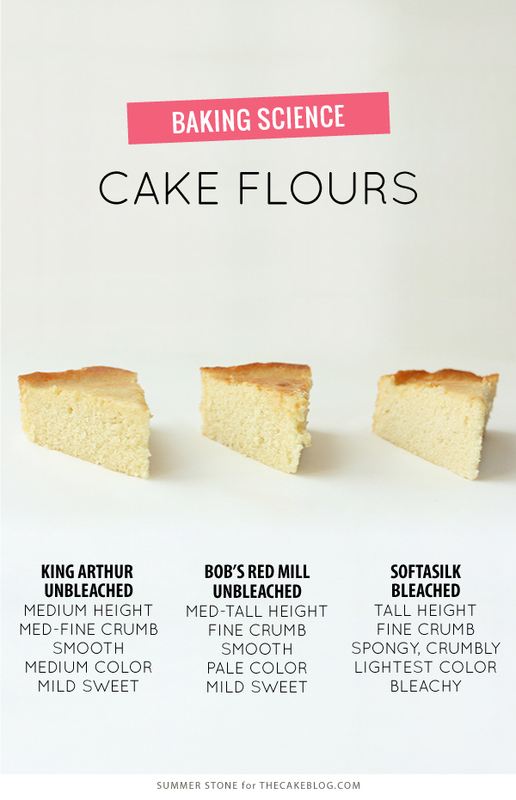 I decided to compare flours commonly used in cake recipes to allow for a head-to-head comparison. The flours included: unbleached all-purpose flour, unbleached all-purpose flour plus cornstarch (a common cake flour substitute), unbleached pastry flour, two brands of unbleached cake flour (King Arthur and Bob’s Red Mill) and bleached cake flour. The two cakes made with all-purpose flour were very similar. It seems that the addition of cornstarch has little effect on the baking results. They were both comparatively short, open crumbed, slightly coarse and darker than the pastry flour. The all-purpose flour cakes also had a slightly “wheaty” taste that I can only compare faintly to Play-Doh. Pastry flour made a cake that was a little taller than the all-purpose flour cakes, finer crumbed, lighter in color and had a much improved texture. It was smooth with a nice mouthfeel and mild, appealing taste. 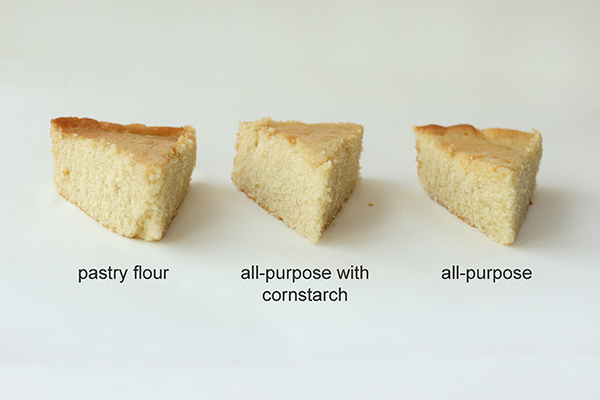 The above photo shows the color variation between the pastry and all-purpose flour-cornstarch cake. While they essentially end up with a similar starch to protein ratio they produce noticeably different cakes. The cakes made with unbleached cake flour were a bit different than that made with bleached cake flour. The unbleached cake flour from King Arthur is made from a wheat flour and wheat starch combination; this cake was slightly darker in color and shorter than the Bob’s Red Mill cake. 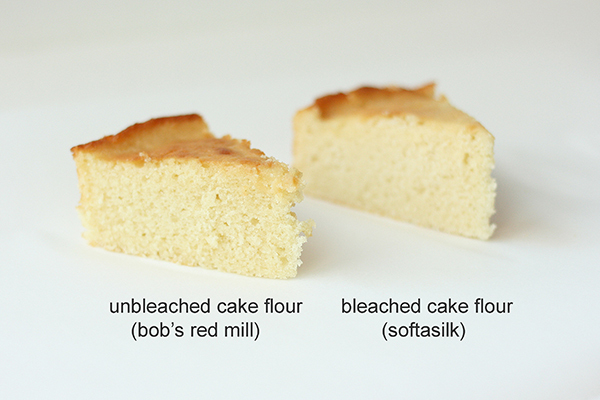 Bob’s Red Mill unbleached cake flour contains only finely milled soft wheat flour. The Softasilk bleached cake flour, made from finely milled and bleached soft wheat, was a bit lighter in color and a little bit taller, but the texture was slightly spongy and crumbly compared to the unbleached cake flours. The bleached cake flour cake also had a very distinct flavor that was absent in the cakes made with unbleached cake flours. The Bob’s Red Mill unbleached cake flour was just a touch darker and shorter than the bleached cake flour as seen in the photo below. 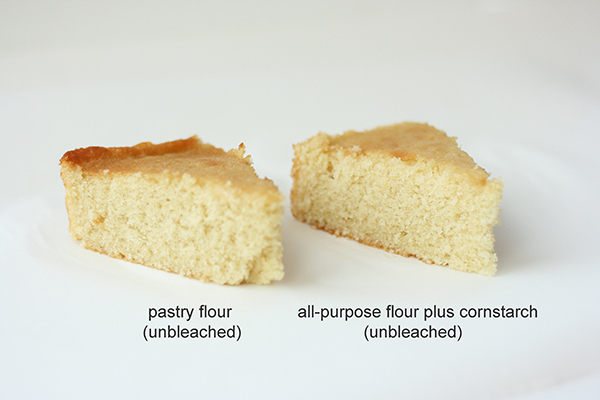 When the unbleached flours are compared in the image below, you can see that the all-purpose flour is the darkest in color and shortest in stature, the pastry flour is a bit taller and a tad lighter, while the unbleached cake flour (by Bob’s Red Mill here) is the lightest and tallest of the unbleached flours. In the end, I was very impressed with the unbleached pastry flour and the unbleached cake flours. While these may be slightly more difficult to locate, their results make it worth the effort. If you cannot locate these types of flours, a combination of half all-purpose flour and half cake flour is a fair substitute (determined from previous experiments). If all-purpose flour is your only option you can still make a wonderful cake, just opt for the lowest protein brand you can find. Thank you so much for this post. I have been using the King Arthur Unbleached Cake Flour since it hit the market. I have been pleased with it and just have made sure I always added it to my order at King Arthur when I would get down to one box. I did not know that Bob’s Red Mill also made an unbleached cake flour. Looking at your results I am going to look for it as it appears to make a slightly superior cake to that of King Arthur’s. I just opened my last box of cake flour on Sunday so your post is timely. I will be looking to where I can find it and trying it out. Thank you for experimenting on our behalf!!! 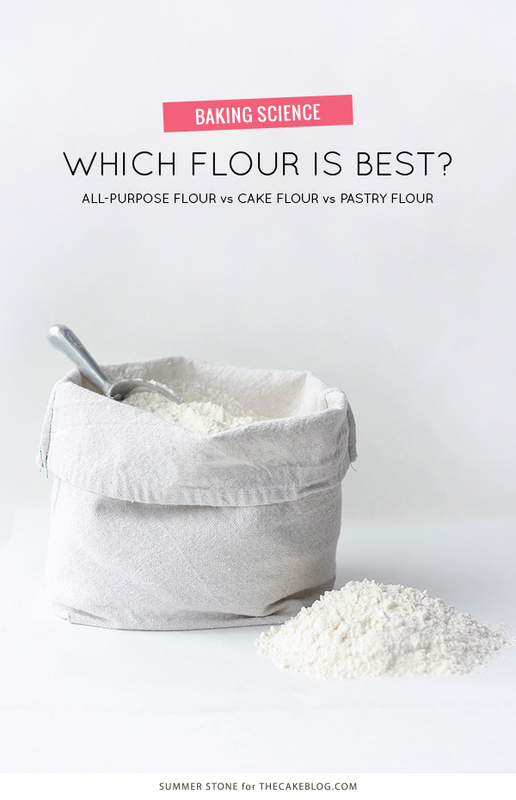 Do you use the cake flours at the same amount is the all-purpose? I use them in equal weight, but it may translate to slight variations in volume. I find that ounce for ounce you can substitute them. If you measure in cups it may be helpful to use a volume conversion chart. Thank you for your experiment with all these flours!… Your family must be very happy to test the final product in each situation! Very useful information! I am confronted with a problem I need your expertise on…I have a niece who is now officially allergic to eggs. 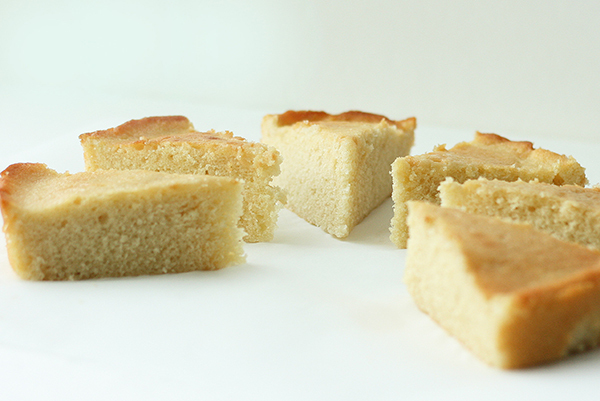 I have looked for eggless cake and found cakes baked with sweetened condensed milk! Tried one recipe ( all-purpose flour plus cornstarch, melted butter, milk, touch of vinegar) and found the cake texture ”heavy”…Tried again with pastry flour…still quite dense cake…Tried again whipping the condensed milk/butter/sugar with Kitchen-Aid instead of a single hand-mixed batter…little improvement! What is your take on this? Maybe this could be your next ”cake lab project” ?!?…. Baking without eggs can be a tricky! One of my family members is allergic to eggs and milk so I have played around with vegan baking for him. Here are a few things I have found. Baking with all-purpose flour is best because you need the gluten protein to make up for the egg protein loss. Oil makes a lighter cake and can be a little more consistent than working with butter. You can add a little bit more baking powder to lighten a cake, but don’t go crazy or it will rise too much and then collapse. Bake cakes in thinner layers and not too large (9 inches or less) to reduce gravity and surface tension effects. I like the cookbook Vegan Cupcakes Take Over the World for some fun eggless cake variations. I hope this helps! Summer! I’ve been waiting for you to come back and blog since you took a hiatus from your site. I’m so glad to see that your name changed! How was your wedding? I know the community would love to see pictures from your big day. Anyway, I’m a huge fan of 1/2 and 1/2 cake and AP flour – most recipes that I bake with use a combination of the two! Sorry Summer, I meant to comment on Tessa’s post. Your flour article is super informative. Your Flour article is superb!!! and very informative too…I think we can predict the quality of the product is depends on the wheat flour manufacturing process.. Very informative, Thanks! I bake with a lot of chocolate (cocoa powder, melted chocolate, chocolate chips, etc.) Do you have the same opinion about using unbleached cake or pastry flour when baking with chocolate? So what brand was the Pastry flour. Hello, your cake blog is so very informative and inspirational to try something new. however, could you please give me the suggestion if we want to make bit healthy cakes for kids to eat, what would you advise?